Annie Hoffman (left), Sonia Sturino, and Cam Jones of Weakened Friends. Cam Jones had a hard time finding a “creepy white van” in his price range, so he wasn’t going to let this one slip away. 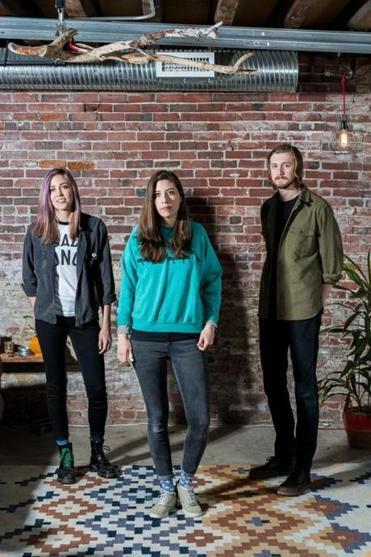 With bandmates Sonia Sturino and Annie Hoffman, the drummer drove two hours north of Portland, Maine, to pick up the new tour vehicle — a 2010 Ford E-150 12-seater with low mileage, priced at $11,000 — only to find the owner had yet to scrape his company logo off the side. “Could you just leave it on?” Jones, 27, asked the man selling the van. “And that was that,” he says. Since then, Weakened Friends has logged more than 40,000 miles across the eastern half of the country in their Tindall’s Lawn Mowing van, passing one milestone after another. Last year Weakened Friends featured J Mascis of Dinosaur Jr. on their second single and won Best Unsigned Artist of the Year at the 2017 Boston Music Awards. Earlier in 2017, they played at the SXSW Music Festival in Austin, Texas. This year they will release their first full-length album with Don Giovanni Records. And this weekend they will play Boston Calling. It was Sturino and Jones who had invited Hoffman, a Boston-based bass player, to rehearse with them in Portland in what was to be a “low-pressure” musical outlet for their uninhibited rock. From this attitude sprung a sound that is brooding yet upbeat. Adding the tremulous guitar work of DIY legend Mascis onto their exuberantly angsty song “Hate Mail” was a dividend of the artists sharing the same managers. Sturino remembers seeing Mascis perform in Toronto, where she grew up. “Who’s that warlock-looking dude?” she remembers thinking, never anticipating that Mascis would lend his guitar magic to a song on her own band’s first full-length album 14 years later. While the band members say they have had some luck, they have also had to put in the work. A month after the band took home their Best Unsigned Artist of the Year award, Sturino started a second part-time job at a glass cleaning company in Portland. The other two members also have jobs on the side: Hoffman buses back and forth to jobs in Boston at Berklee College of Music and Zippah Recording, and Jones works in the kitchen at a Portland senior center. Sturino says Weakened Friends’ upcoming 10-song album, “Common Blah,” planned for release in October, is about the bad relationships she had before the collaboration with Jones and Hoffman. (The full-length will include “Hate Mail.”) And even if the record will be their first signed to a label, Hoffman says it will still have the self-produced “vibe” of their previous EPs and singles. Living together under one roof, rehearsing songs in the basement, and long road trips have only made Sturino, Hoffman, and Jones closer. Sturino and Jones have played Boston Calling before, in 2014 with their former band the Box Tiger. “The day before I was playing in front of thousands of people and rocking out — getting free stuff — and then the next day an old lady [at the senior center] was getting mad at me because the cranberry juice was too diluted with water,” recalls Jones. The band plays at the festival Sunday; this time Jones plans to take Monday off.